Indestructible dog beds are a great way to keep your pup’s bed looking nice. Even if he thinks it looks nice enough to eat! Does your dog like to gnaw on his bed? Are you fed up with buying him lovely new bedding only to find it destroyed moments later? Well don’t panic! You aren’t alone, and there are solutions! 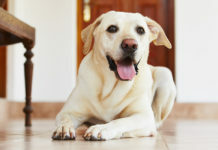 Destructive chewing is pretty common in some breeds of dogs, and especially working breeds like the Labrador. Constant chewing can sometimes be caused by pain, anxiety, hunger, illness, or boredom. But it can also be a perfectly natural thing with no underlying cause. Which means that you need to choose your dog’s bed to take into account his chewing. 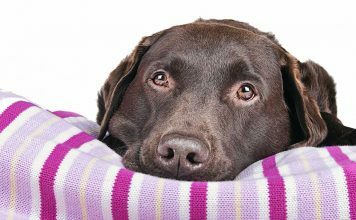 We’ve found a selection of the best indestructible dog beds for chewers, gnawers and general bed eaters! Young dogs will chew to relieve teeth pain and to keep their teeth clean. But older dogs may continue to chew because it is part of their learned behavior. This can be because it helps them relieve stress and anxiety, or simply because they enjoy it. Do Dogs Grow out of It? You may assume that your dog will grow out of their chewing phase as they get older, but this isn’t always the case. 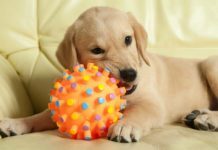 The worst may be over by the time your dog turns two, but it’s still a good idea to have plenty of chew toys, bones and other things that your dog can sink their teeth into. Destructive chewing may be a symptom of a larger problem, but it could also be a result of boredom. One of the Labrador’s key skills as a working dog is their ability to find and retrieve things that they will carry back in their mouths. 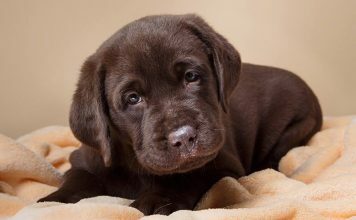 Labrador’s are very oral animals, as are many other hunting breeds. They tend to like carrying objects around in their mouths. That is what they have been bred to do and it’s normal. 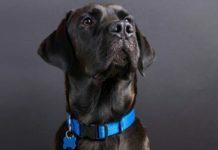 Chewing is perfectly natural, but it becomes an issue when your canine friend starts eating your shoes, furniture, dangerous items like electrical wires. As well as their own possessions like their dog beds. Dog beds are one of the most commonly chewed household items. How many times have you bought a lovely new dog bed just to see it destroyed in a matter of days? You want your pet to have a nice place to sleep, but it can be really expensive to keep replacing dog beds all the time. Dog beds that are described as ‘indestructible’ are normally designed for the most destructive chewers. These beds are meant to be able to withstand anything your dog tries to do to them. Indestructible beds often come with metal frames, non-grip and/or tough material, and elevated surfaces. 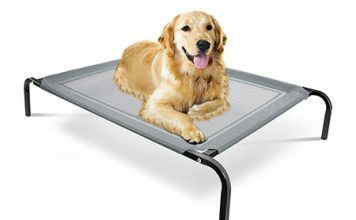 Made of materials that can withstand your dog’s jaws or make it very difficult for your dog to bite into the bed at all. If your dog realizes they are unable to chew on their bed then they should eventually give up and go back to their chew toys instead. There are a lot of dog beds on the market that are described as ‘indestructible’, but the quality and style widely vary between different products. This is our current favorite. 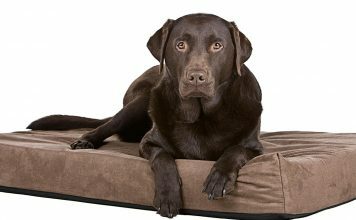 Kuranda is a well known dog bed manufacturer which specializes in chew resistant and chew proof beds. This bed has a high chew proof strength and features a strong aluminium frame that is ideal for heavy dogs. This is a raised bed that will keep your fluffy dog cool during hot weather, the bed is easy to clean, and the material they use is abrasion resistant. This bed also comes with a one year warranty so you can get It replaced or refunded if it does not meet your expectations. But not every dog needs the toughest bed. The terms indestructible, chew proof and chew resistant are often used interchangeably by retailers. But loosely speaking a chew proof bed is a type of dog bed which cannot easily be chewed up. Your dog may be able to get a grip on them with their teeth, but the bed should be able to withstand some amount of chewing. The Blueberry Heavy Duty Pet Bed will stand up against the efforts of moderate chewers. It is a good looking bed for one with chew resistance. And should be pretty comfy too! Another comfortable choice is the K9 Ballistics Chew Resistant bed. It’s cute circular shape comes in a variety of colors and sizes. And should be tough enough to withstand moderate chewing. Many owners, ourselves included, have found elevated dog beds a great solution to chewing. Dogs seem to be more inclined to chew the metal frame. They find it harder and less appealing to get their teeth around the excess material, as it is stretched tight. Although they aren’t manufactured for this purpose, we find that they can really do the trick. Here are a couple you might like to try. The Amazon Basics Elevated Cooling bed comes in several sizes and two different colors. Not only is it a great, and cool, place to lay down, it’s portable too. This model is another great choice for fans of the elevated dog bed. It also comes in a variety of sizes. And has the benefit of being waterproof and easy to keep clean. 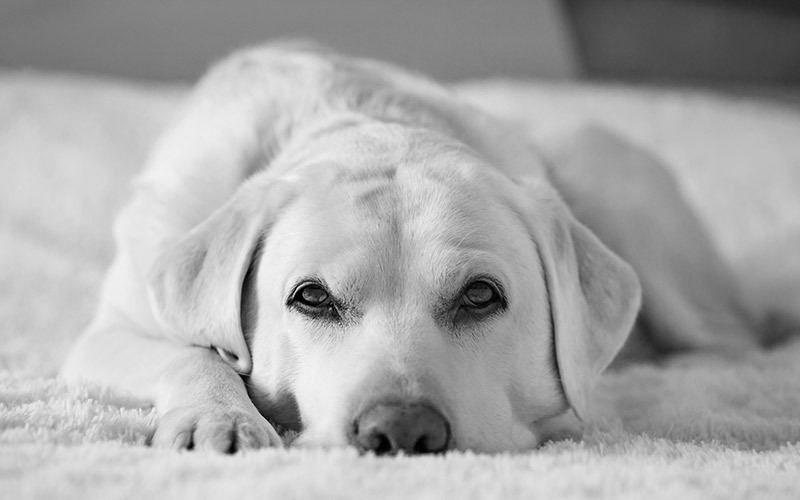 Although chew resistant dog beds are not indestructible, they are sturdier and tougher than regular beds. Chew resistant beds can still be chewed, but as the name suggests they are much harder to destroy because of their durable material and chew guard features. These beds are designed for less destructive chewers as highly destructive dogs are still likely to break them. Raised beds are a popular choice because it is harder for your dog to firmly grip and thus completely chew/rip the material. These beds also have the added benefit of keeping your dog cool during the summer. The K9 Ballistics Dog Bed has been made for light or moderate chewers, so it is not the best choice for extreme chewers who require a totally indestructible bed. The cover is made out of a durable, water-resistant material which can be easily cleaned by hand or machine. It has an odor resistant polyester mattress, you can use It indoors or outdoors, and the company will replace the cover if it is damaged within 90 days of ownership. The K&H Pet Cot is a great choice if you want to go for the raised bed option. Furry dogs can overheat fairly easily, but luckily this bed is elevated and features a mesh center which will keep even the fluffiest dog cooler during hot temperatures. This bed can be used inside or outside the house, it is water resistant, and it has been tested for its durability. This bed also comes with a one year warranty, so you can always get your money back if it turns out to be flimsy or poorly made. This goDog bed is chew resistant. This bed is not designed to be indestructible, but it does come with chew guard technology which should make it last longer than regular dog beds. This bed is best suited or moderate chewers. The goDog bed also includes a plush bolster border, a durable mesh liner, and a non-skid bottom. Some people like to buy anti-chew furniture sprays that are designed to repel your dog. 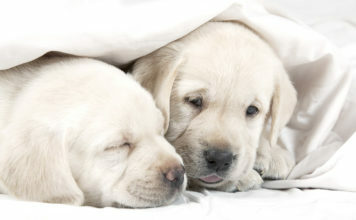 You can use these sprays on your dog bed provided the ingredients aren’t dangerous for your dog. 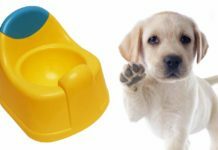 Anti-Chew sprays are a good option if you are looking to train your dog not to chew on the furniture. It works as a safe repellent which should in time condition your dog to avoid the items they associate with the unpleasant taste. 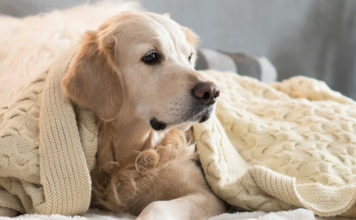 If you do choose to spray your dog bed with an anti-chew spray then make sure that it’s not so strong and repellent that it will stop your dog using their new bed. There’s no point in having a perfectly preserved dog bed if your dog doesn’t want to use it! And it’s worth noting that some dogs don’t mind the taste, and will happily chew away anyway. But for those dogs that don’t like repellent spray, here are some options. This Bitter Lemon anti-chew spray is a good choice. It is a safe and gentle deterrent which tastes nasty but won’t harm your dog in any way. This spray uses a non toxic formula which is made out of natural bitter and lemon extracts. It is also safe to spray on objects, although keep in mind that it may make them smell afterwards! This spray is safe to use on wood, curtains, electrical cables and clothes. There’s no point in having an indestructible frame if you still have to keep replacing the dog bed cover, sheets, and pillows! Some of the cover materials you should look for when buying a dog bed include various types of nylon. Such as codura and ballistic, vinyl weave or vinyl 40 oz, or material which is classed as ‘military-grade’. 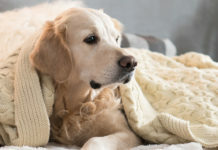 Memory foam is a good mattress choice for your dog because it is a comfortable material which will support your dog’s weight and ensure a comfortable nights sleep. Firm, round, slippery-material covered pillows are another popular choice for medium to mild chewers. These pillows are slippery so it will be hard for your dog to grab onto them with their teeth. Try to avoid beds which have obvious zips as they tend to get ripped very quickly. You’ll want to go for something firm, slippery or hard to grip, and something that is both comfortable and durable. This stain proof dog bed cover is durable, easy to clean and should be able to withstand determined chewers. The cover is made out of synthetic polyester fibers, it is machine washable, surprisingly waterproof. And most importantly, the cover incorporates stop rip technology to stop the dog tearing it to shreds. 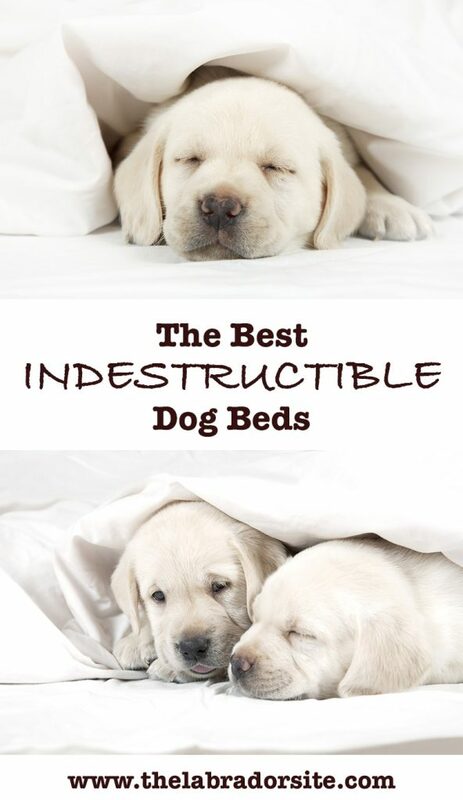 There are a lot of dog beds out there that are described as ‘indestructible’. But many of them have bad ratings and a string of dissatisfied customers. It’s important that you look at the average rating of any bed before you buy it. As it is a good indication of how good the bed is in real life. It’s important that you buy a strong and durable bed that your dog can’t rip apart in the first five minutes. But it’s also important that your dog is comfortable in their bed. There is no point buying a dog bed that your dog doesn’t want to use! 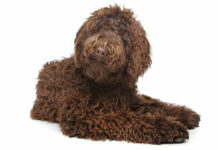 Previous articleMy Dog Ate Chocolate – What Do I Do? Will He Be Okay? Next articleCan Dogs Eat Cherries – Is It Safe To Share This Fruit with Your Dog? I would recomend Maximum Pet products dog beds. Best we seen on the market! You don’t mention TUFFIES CHEW PROOF beds. I have had mine for more than 4 years now. I have replaced one cover not due to chewing but to digging. Replacement covers are cheap and easy to fit. And they come with a guarantee! My dogs love them and haven’t chewed them at all – because there is nothing they can chew. The beds are waterproof, warm, have a nice wide rim to rest the head on and have very thick duvet-style material in the base. They wash with the hose or with soapy water and dry very quickly since they are waterproof.